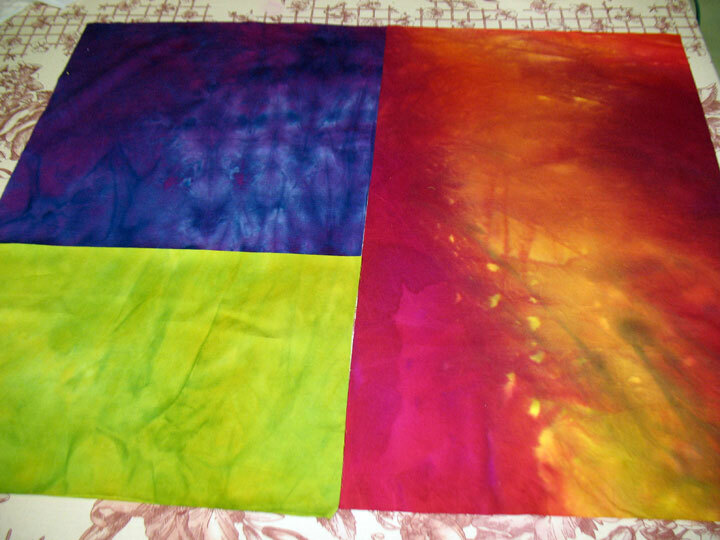 Dyeing Fabric..The Quick, Easy and Fun Way! It’s all much easier than you’d think! 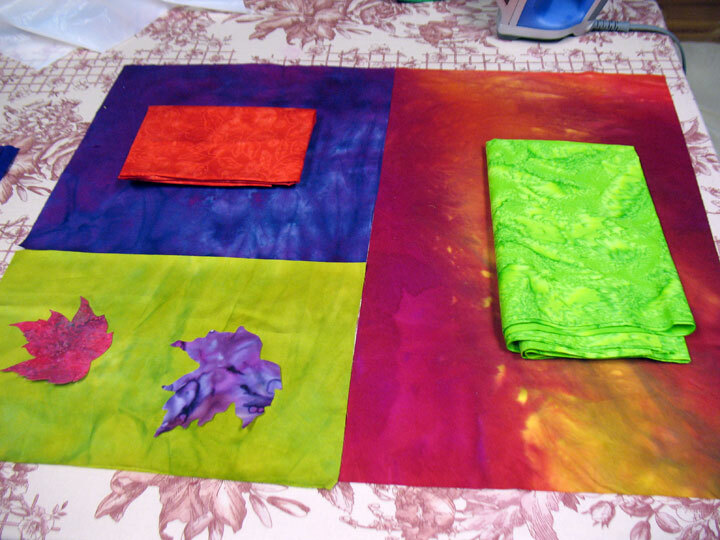 We are now officially in the best season for fabric dyeing here in the old USA, so I thought it might be fun to make a video showing exactly how I dye background fabrics like these. Thanks to my husband, Ernie, you can watch a video that lays it all out clearly right here. 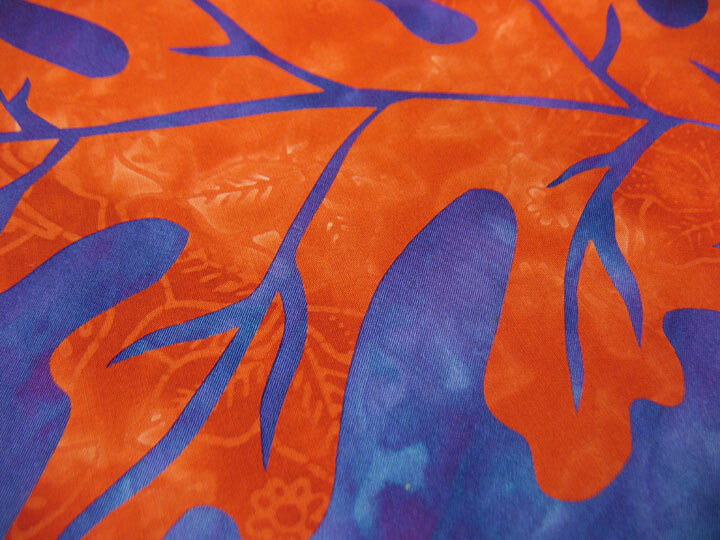 FABRIC SALE, Majestic Feathers and New Notions! Hope everyone is enjoying this wonderful weather and been able to spend some time outdoors. If you’re looking to fill some missing colors into your fabric stash, we’re having a sale on all our fabrics this week! You also need to check out Patsy’s new Majestic Feathered Wreath CDs. These new wreath designs feature intricate spine designs and hyperquilted feathers and these quilting designs can be stitched on your embroidery machine. We’ve also got some great new patterns and notions, and you can read more about all of them below! All Fabric will be an additional 25% of MSRP!! This is in addition to the free shipping our store now offers, and an additional discount on products for our International customers! These are HUGE savings that you can’t miss! Beginning immediately and running until Friday June 6, 2014 @ 9:00 AM (EST). Enter the discount code: FabFabric at checkout to get the discount! The products in this newsletter are all new, so for the first week in the store we will be offering them at a reduced introductory price. You will not need to enter a discount code to receive these introductory savings and the prices are valid until June 6, 2014 at 9 am, E.S.T. This collection of feathered wreaths can be quilted with an embroidery machine, either on your final quilt sandwich or as a trapunto layer on individual quilt blocks before the quilt is actually pieced. Either way, their graceful plumes and intricate design detail will add a level of sophistication to your quilt. 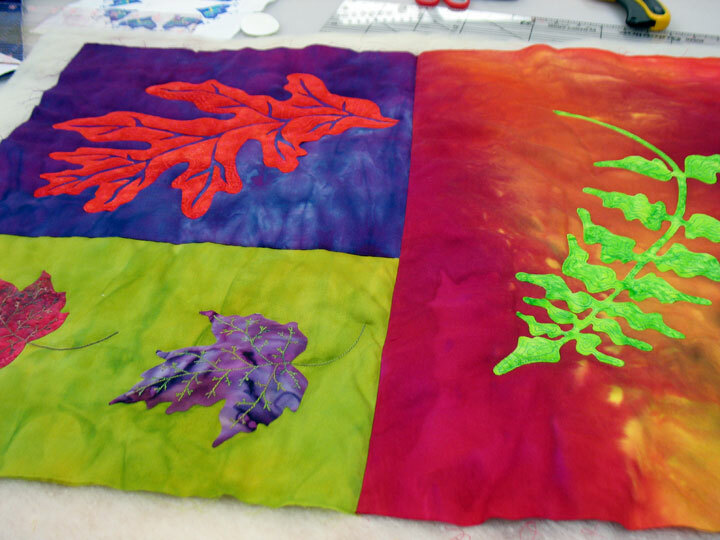 This collection of feathered wreaths can be quilted with an embroidery machine, either on your final quilt sandwich or as a trapunto layer on individual quilt blocks before the quilt is actually pieced. 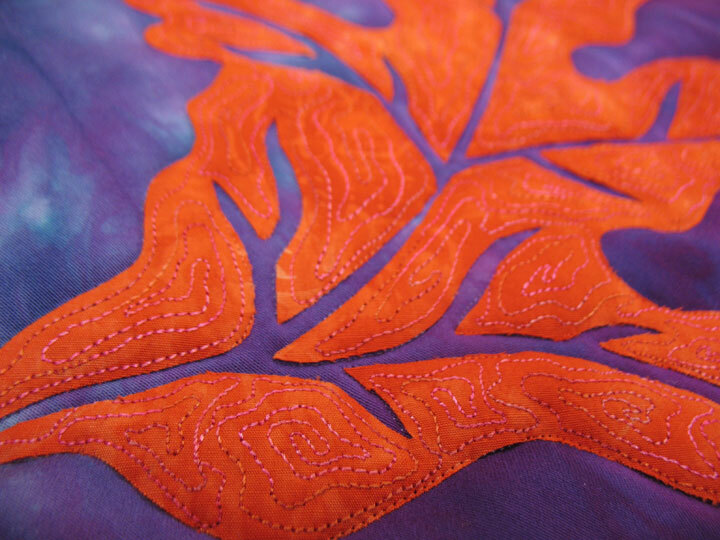 Either way, their graceful plumes and intricate design detail will add a level of sophistication to your quilt. This CD contains all wreath designs from Volumes 1 & 2 of our Majestic Feathered Wreaths collection. Easy-to-read black and red markings. 1in grid with 1/8in and 1/4in increments on this 2-1/2in x 10in ruler. 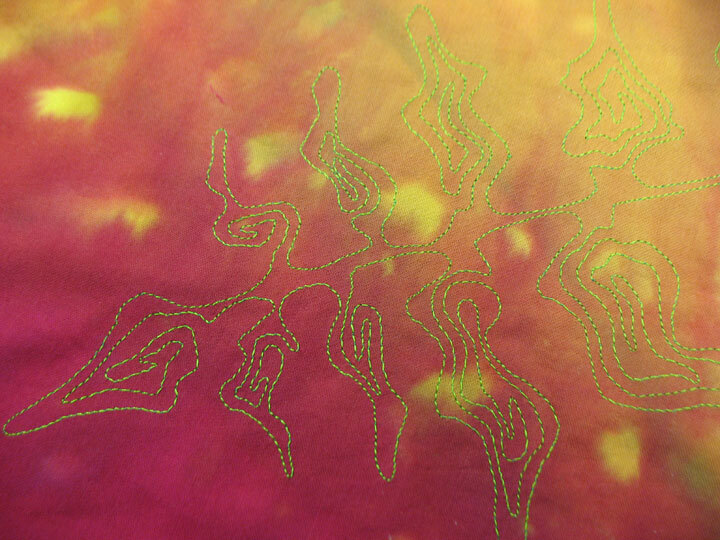 Embedded heart-shaped Gripper Dots hold fabric while cutting. 1/4in seam allowance marked on one side. Exclusive line. Independents Only. Made in the USA. Set includes one jumbo ruler for 5in x 10in geese plus 2-1/2in x 5in geese; one smaller ruler for 2-1/2in x 5in geese plus 1-1/4in x 2-1/2in geese; and an instruction booklet with step-by-step directions. Another fabulous template from Darlene Zimmerman. 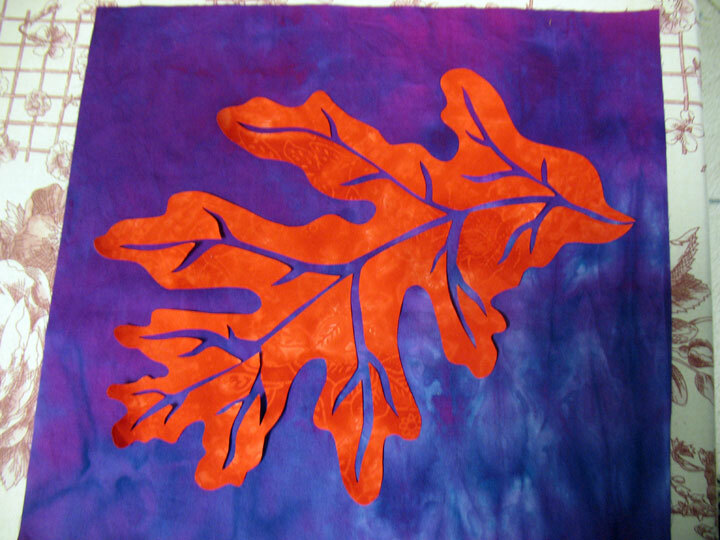 Ease of use makes cutting and piecing this favorite a fun project for any skill level. Perfect for effortless ripping out of seams, cutting threads & buttonholes. The quality steel blade retains its sharpness & the small ball point protects the fabric; while the soft handle provides a better grip. Ergonomic handle provides better grip and comfort for controlled results. Curved tip ensures beautiful curves on pockets and collars. Easily get under seams. If you work with small fabric pieces or embellishments, these sequin pins from Piece O’ Cake Designs are just the right size to secure your work without getting in your way. 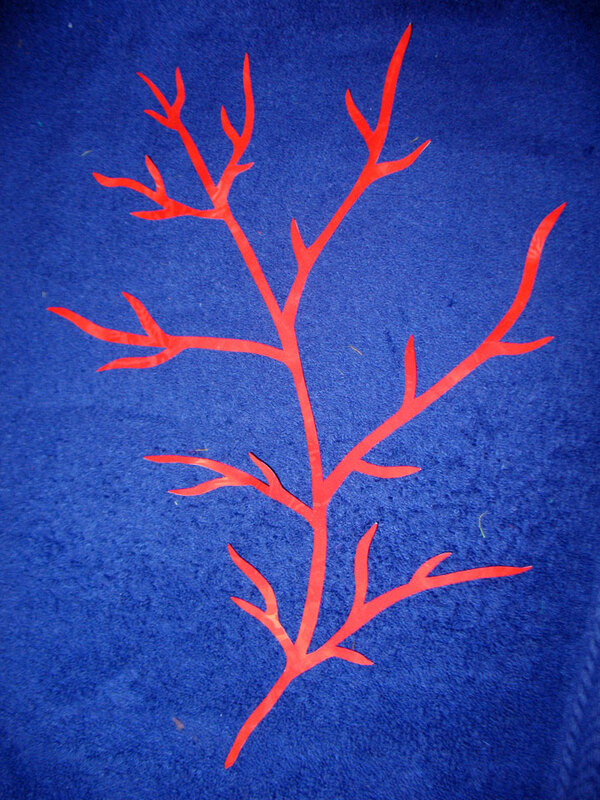 Essential Applique Pins have small heads, super-sharp points, and are 1/8in longer than ordinary sequin pins. You’ll be surprised how much easier that extra 1/8in makes them to handle! Extra-sharp, 5/8in nickel-plated steel sequin pins, 500 per box. 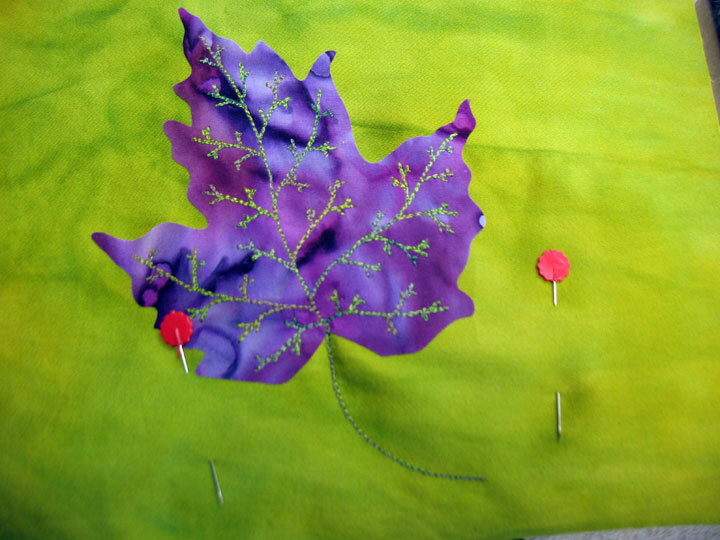 Use for applique, basting English paper piecing, pinning sequins and other embellishments, or any kind of sewing. They’re the perfect size for even the most detailed stitching. Have you been looking for a way to sharpen your tailors chalk like below? Make sure to check out the new sharpener to get a precise line every time! Includes 2 pieces of chalk, one white and one blue. Felted wool and mohair on a goat leather strap. Ready to stain or paint. Ready to hang with keyhole slot. 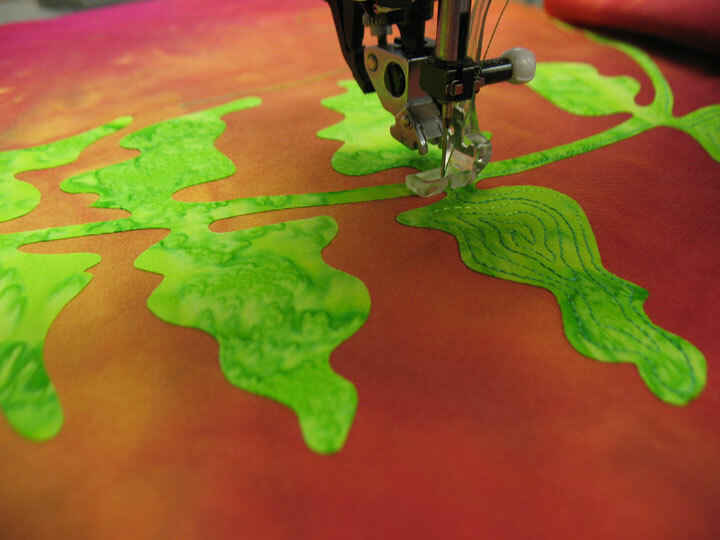 Get a head start on your embroidery projects. Stop searching for stabilizer, simply store all of your stabilizer in this convenient, roomy organizer so when it’s time to embroider, just select the one you need and get right to embroidering.10 large see through pockets allow you to store a variety of stabilizer rolls and pre-cut sheets. Just hang the organizer on a door from the metal grommets in the reinforced top using the three included metal hooks; also can be hung on a wall with nails through the grommets. 10-1/4in W x 11in H x4-1/2in W without gussets. a quilted backpack that converts to a shoulder bag in 2 styles. Filed under Site Updates. 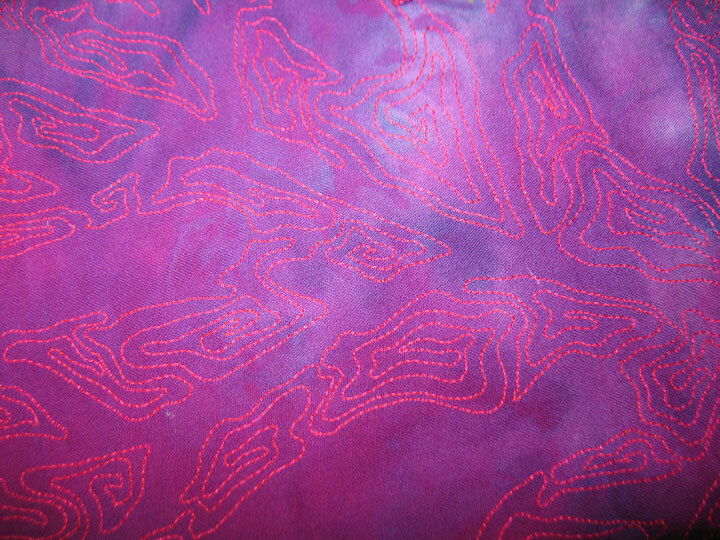 Comments Off on FABRIC SALE, Majestic Feathers and New Notions! 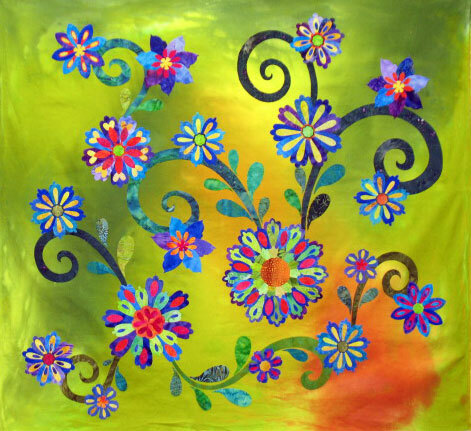 I love working with rich, saturated colors like this…makes my heart flutter! Back from Quilt Market and Back to the World of the Living! 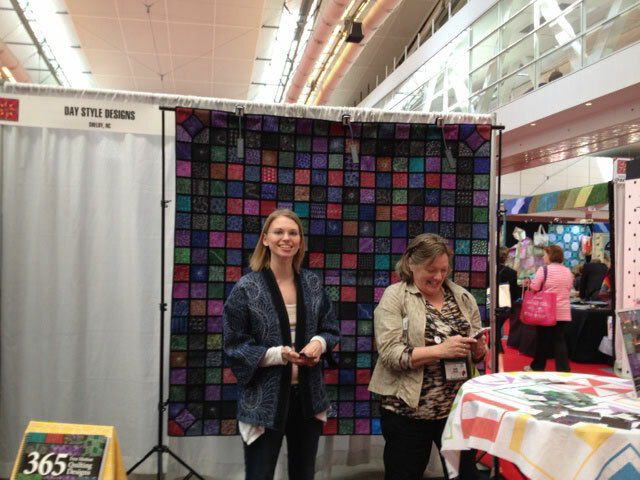 …and it really made her booth stand out. 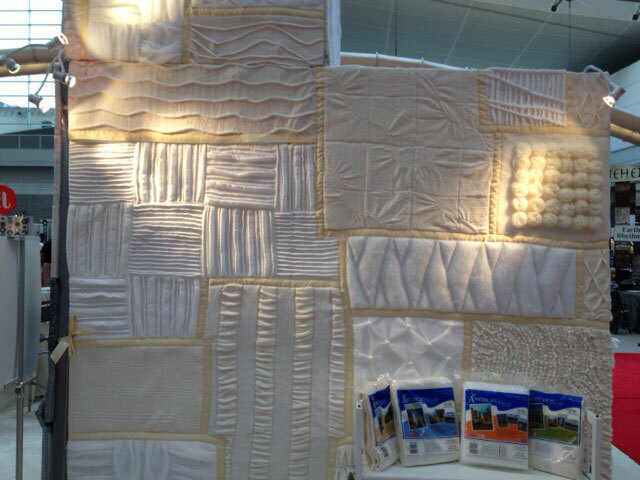 (I think that’s important at Quilt Market. 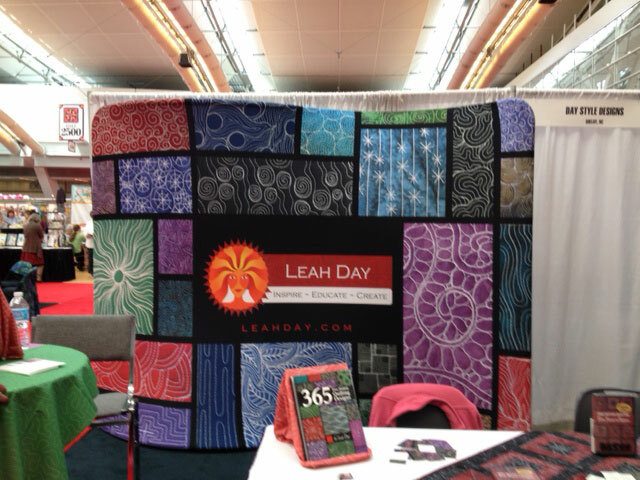 So many booths look alike that you need something unique to set yours apart and Leah really did that.) She also had her husband, Josh, working the booth and he was so nice! 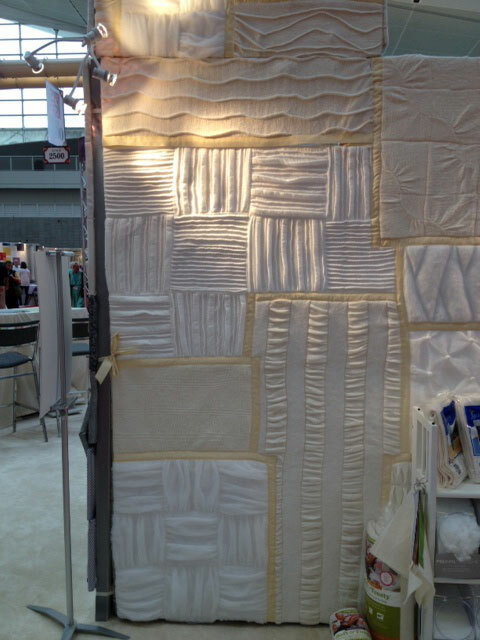 If you haven’t been following Leah’s blog, this is a musty-read for anyone interested in machine quilting! It was quilted by non other than Angela Walters, another quilting super star whose blog is also worth following for free motion quilting designs.